You can set up profiles in iTerm to facilitate the build process with just a few clicks. This can make it a lot easier to quickly build multiple outputs. When you’re working with tech docs, a lot of times you have builds that push files onto different servers, or that build the content for different environments. It can be a hassle to type out these commands each time. 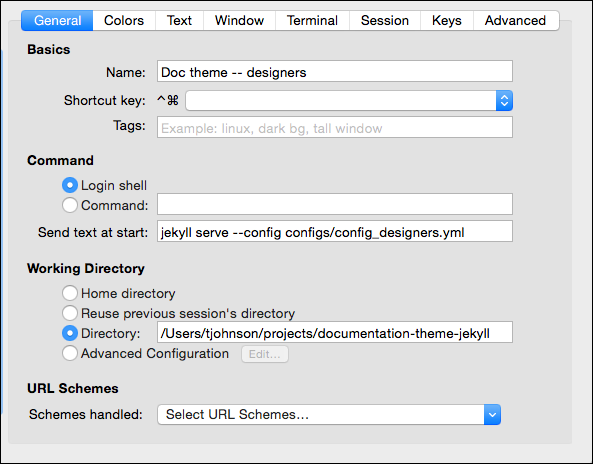 Instead, it’s easier to configure iTerm with profiles that initiate the scripts. Open iTerm and go to Profiles > Open Profiles. Click the + button in the lower-left corner to create a new profile. In the Name field, type a name describing the output, such as Doc theme -- designers. Leave the Login shell option selected. In the Working Directory section, select Directory and enter the directory for your project, such as /Users/tjohnson/projects/documentation-theme-jekyll. In iTerm, make sure the Toolbar is shown. Go to View > Toggle Toolbar. Click the New button and select your profile. Tip: When you’re done with the session, make sure to click Ctrl+C.